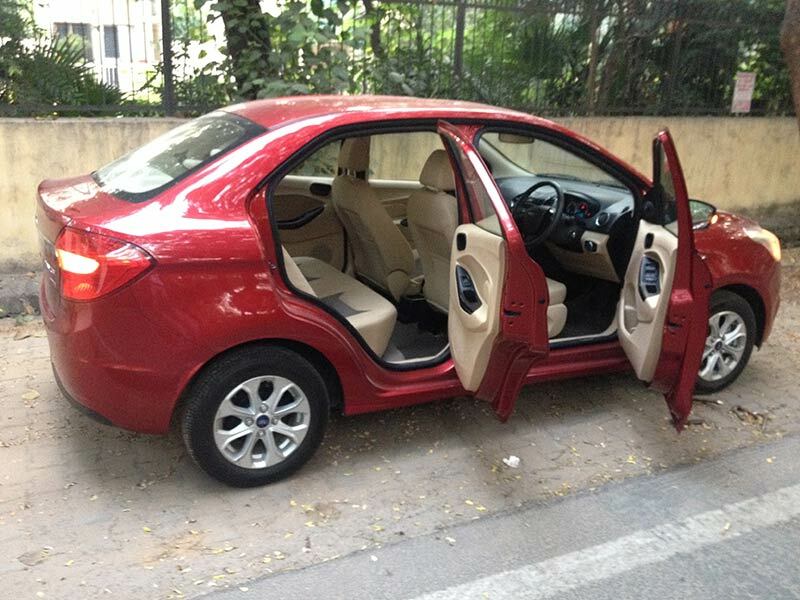 The all new 2015 Ford Figo Aspire TDCi diesel in “Titanium” trim comes in the attractive “Ruby Red” paint here featured and carries certain premium features that cars of a higher segment generally option. The relevant segment (sub-4 metre sedan) in India is highly lucrative in terms of sales volume, but consequently invites fierce competition from rival manufacturers (Honda Amaze, Suzuki Swift Dzire, Hyundai Xcent and the Tata Zest), something that is expected to intensify further as we travel through the festival season. Ford should therefore brace itself for a bare knuckle fight, ‘quite elementary’ is what a certain distinguished gentleman would remark. 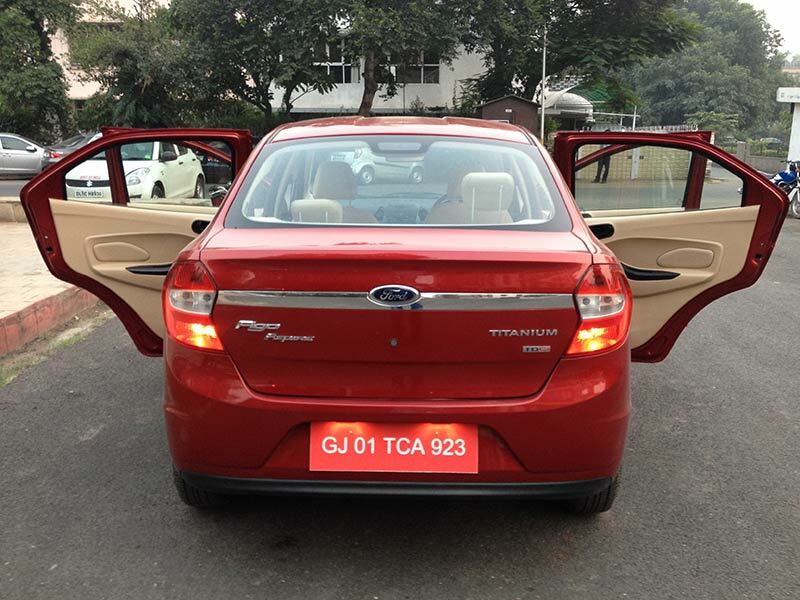 The demand for a sedan in a sub-4 metre body length has been a design puzzle that some have been more successful at than others and to my eyes, Ford has cracked it and that is almost half the battle won. The Figo Aspire looks attractive (especially in the ‘Titanium’ trim), helped by the Aston Martin inspired front metal grill and is well proportioned. The standard of fit and finish is impressively high, and this includes the external body paint, switchgear, plastics and fabrics used to put together the interiors. It is also quite an achievement the level of space that has been achieved inside the cabin where a fit family of 5 could travel in relative comfort despite the transmission tunnel running through at the back. Ford has managed to also provide a cavernous 359 litres of luggage space in the boot, impressive for such a small car and for the generous cabin space it also provides. 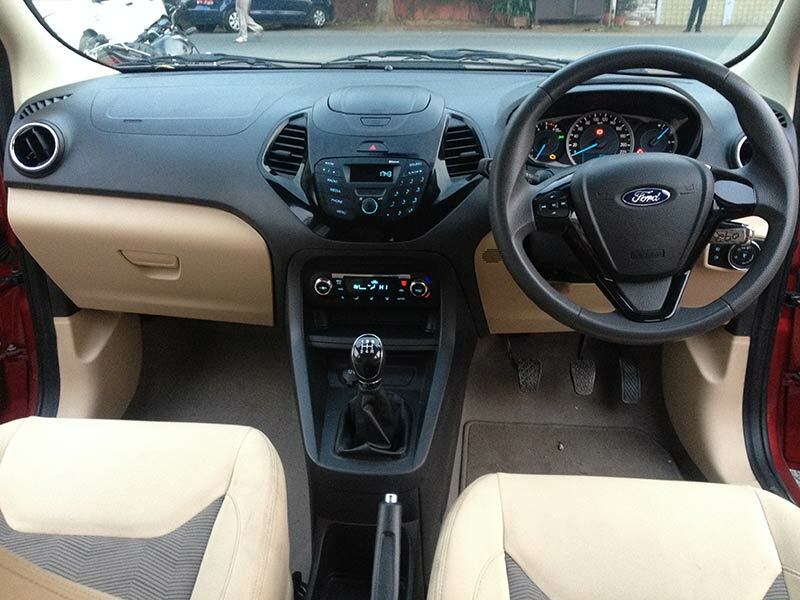 The cabin is also airy with large glass area for good all round visibility, tastefully finished with a contrast between dark (piano black inserts in the dashboard and steering wheel) and light coloured materials. The audio system looks a bit dated in design but works very well with a quality sound and feel along with a host of functions including bluetooth connectivity as well as separate ports for Aux-in, USB and a 12V power point up front. The air-conditioner works very well to cool things down, which in the ‘Titanium’ trim is digitally controlled through high quality metallic dials. There is also plenty of storage on offer but a central armrest is a noticeable omission to an otherwise packed options list, with power windows, central locking, keyless entry and power door mirrors as standard on the trim along with front airbags. The tiltable steering wheel is meaty to hold and features multi-functional controls for the audio to ensure you never take your eyes off the road. The driver’s seat has an additional adjustment for height to ensure that every sized individual can find their optimum driving position behind the wheel. The Figo Aspire feels very well built, the doors have a good weight to them and everything clicks and thumps into place with a reassuring sound that most Germans are noted for. Importantly the quality of interior switchgear and finish is also impressive for a car of its class and provides a premium feeling to the occupants in its current ‘Titanium’ trim. Despite being driven on bad and broken roads, the car let in no loud crashes or bangs and the interior similarly stayed silent of creaks and rattles. Ventilated discs up front and drums at the rear wheels assisted by ABS (Anti-lock braking system) and EBD (Electronic brakeforce distribution system )provide good braking and inspire confidence. In the featured trim, both driver and front passenger also get airbags as standard as a last measure of safety. The ‘Titanium’ trim also gets additional safety features like door ajar warning sound, front 3 point seat belts, rear seat belts, driver seat belt reminder amongst others. 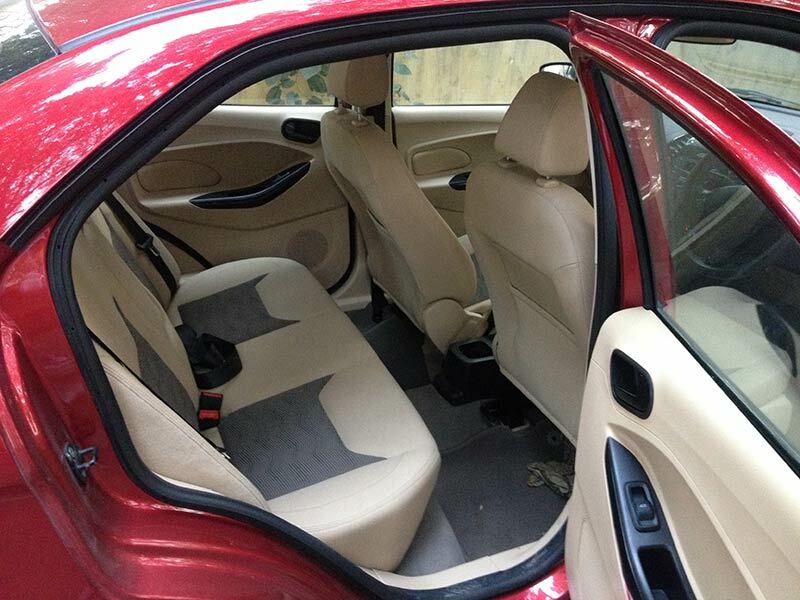 The car also provides the driver and front passenger with airbags as a last measure of safety. 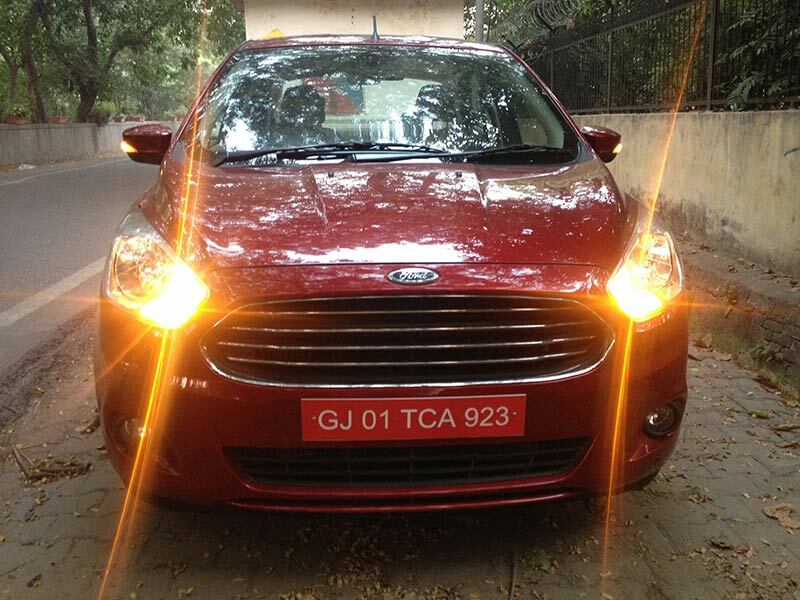 The Figo Aspire draws 98 bhp of power and 215nm of max. 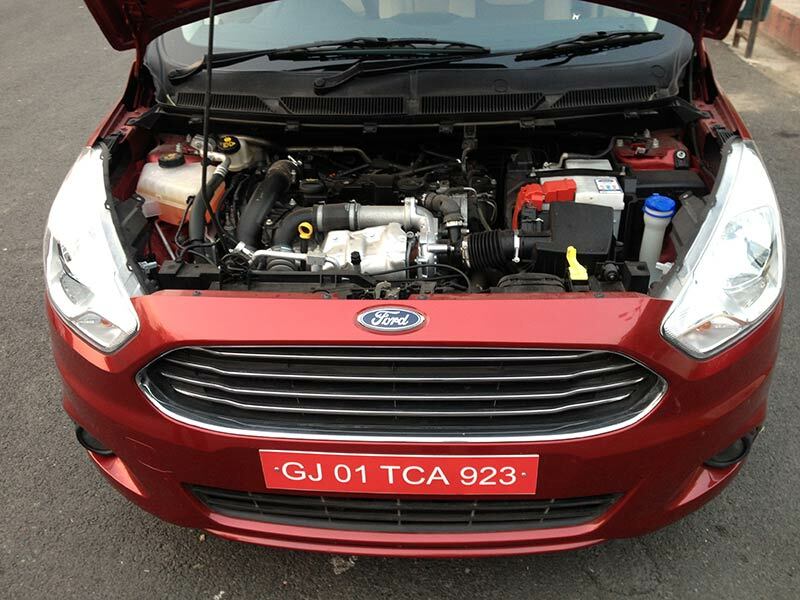 torque from a 1.5-litre turbo diesel. The engine note is impressively muted at idle and low speeds, though go past 2000 rpm and the diesel engine become quite audible though not exactly harsh, possibly also because of the cabin insulation and otherwise good NVH levels achieved. The engine feels powerful enough and does respond well to the occasional clarion call but in sudden overtaking situations one would need to be in torque band to pull off the manoeuvre without breaking a sweat. On everyday drives, the power on tap is more than adequate and never do you find the engine out of breath even with the aircon on and a full house. The Figo Aspire feels well planted at normal driving speeds and inspires confidence through a well weighted power steer, which directs the car well with a hint of play at high speeds and some body roll. The dash to high double digit speeds comes up in fairly quick time provided you rifle up the robust and precise 5-speed gearbox whilst in the meat of the torque band (approx. 1500-2500 rpm). The stated ground clearance of 174 mm and suspension set up, riding on 175/65 R14’s paired with the smart looking factory alloys (which may to some appear a tad undersized) drive the front wheels in a composed manner through the worst or lack of asphalt at times. The car soaks up the poor road conditions well and no loud thuds or crashes filter through to the cabin. Ford claims approx. 25 km/l and that is not a bridge too far in my experience. Through 2 days and 140 odd kilometres, with a mix of city and highway driving at a heavy foot on many occasions with the aircon on, I easily achieved upward of 18 km/l, which I am fairly confident could be easily improved if I just had fuel returns on my mind. This should therefore please the fuel return conscious buyer who is looking to clock up some large numbers behind the wheel. The fuel tank capacity of 40 litres should also prove adequate for most distances given the high mileage of the Figo Aspire in the diesel version. 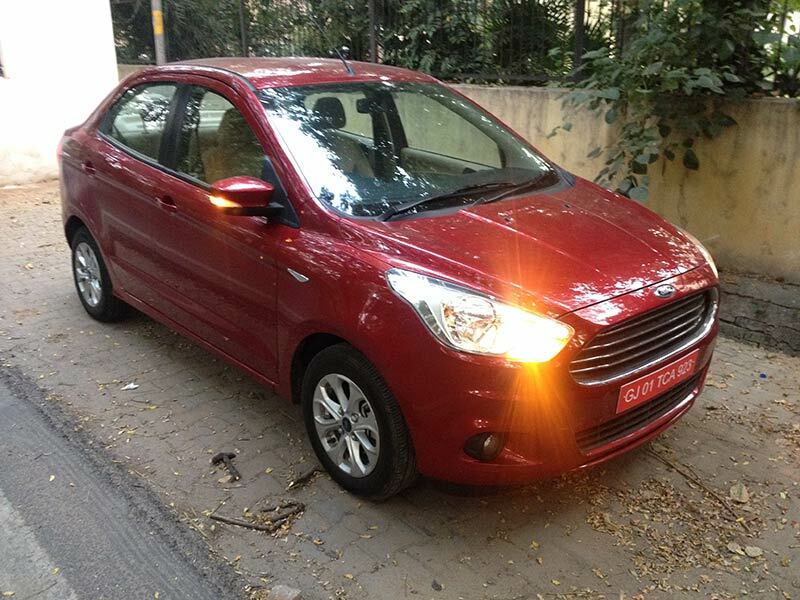 The 2015 Ford Figo Aspire TDCi diesel in “Titanium” trim retails at approx. Rs.7.70 lacs (ex-showroom) at is priced at par with the competition, that is aplenty. The Figo Aspire also comes in a higher (Titanium Plus) and 2 lower trim levels as well as a petrol variant, with the range starting from around Rs.4.90 lacs and topping out at around Rs.8.3 lacs. 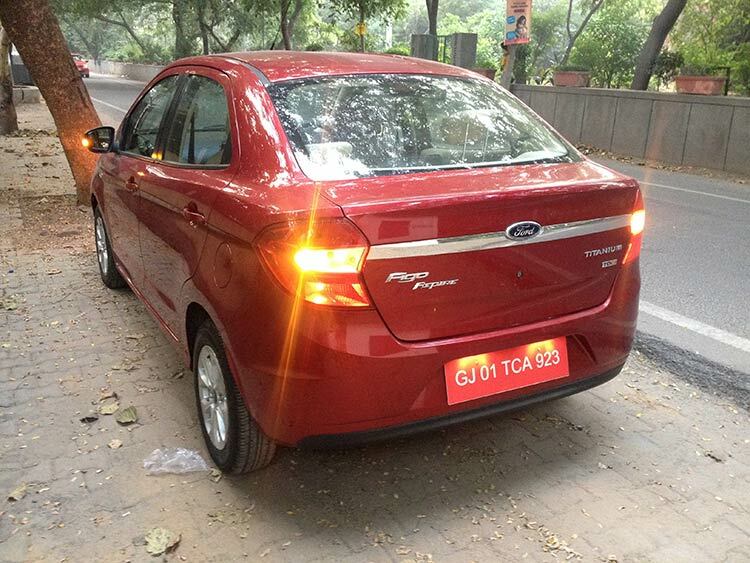 (Check all Aspire variant prices) To my eyes and brief personal experience, I think Ford have got a good thing going with the Ford Figo Aspire that does everything well and is possibly the new segment leader, even if I do say this without having personally tested the competition. 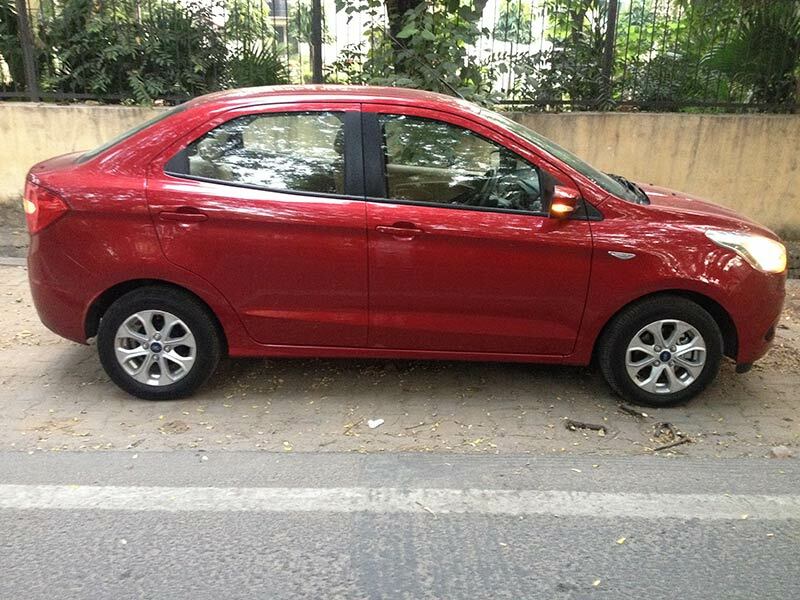 Notwithstanding that disclaimer, every buyer in the market for a sub-4 sedan should religiously test drive and consider the Ford Figo Aspire at a trim level within their budget to form their own opinion. 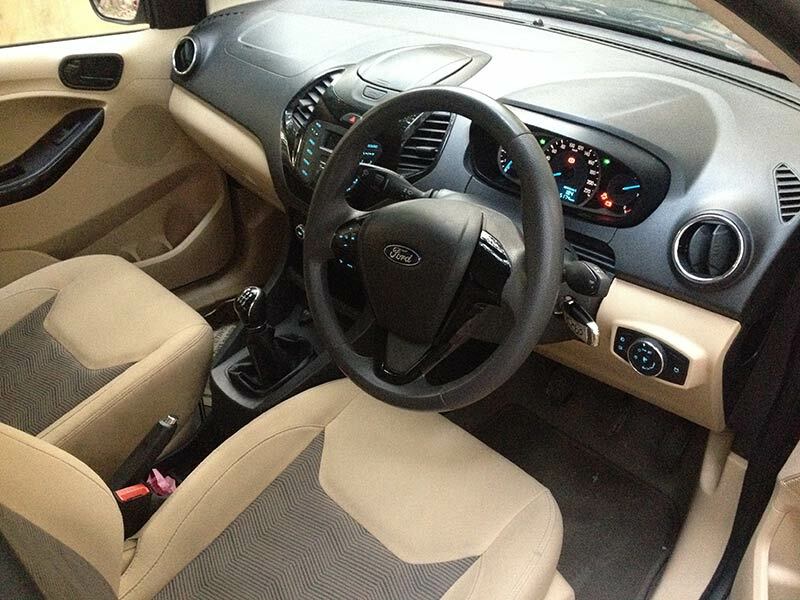 Download Ford Figo Aspire Brochure from here.